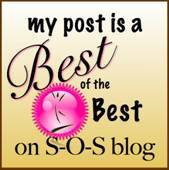 Last week, I decided to get a headstart on the holidays by searching for cute, used costumes for the kids. Javi decided he wanted to be a werewolf. * I decided that (since I'm Team Jacob) Billy should be a daddy werewolf so they would be a matched set. 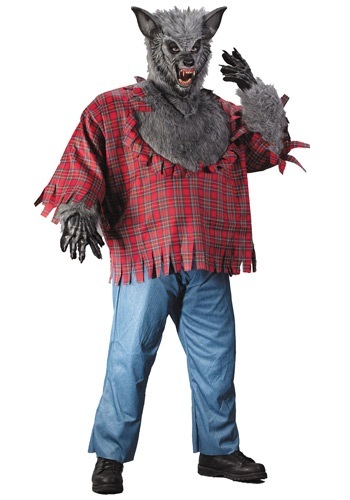 Naturally, that led to looking at pages and pages of werewolf costumes (they even make one for men on the ... larger side). It became a family activity. We all sat together on our comfy red couch and looked at cheesey werewolf costumes on the Internet. Until Bella (rudely) reminded us that she's two years old and werewolves are scary. Every three images she'd scream. And yell "dat ebil, mama!" And then cry because we were looking at the pictures without her. So three more images would pass before she screamed again. We rode that rollercoaster for a while and then closed up shop to put the kids to bed. I didn't really think about it again until the next morning. I went in to get Bella up and her first words to me were: "No where-da-woold, Mama. He ebil. Daddy a bumbabeed." And there was such conviction in her voice and in her eyes, that I simply said, Okay baybell. Daddy is a bumblebee. ** And she said (in her mogwai voice), "Yeah. I da bumbabeed, too." And so she is. My sweet Bay picked out her own costume for the first time in her short, amazing little life. Now I just have to convince her that, no, she can't wear the wings without putting on the whole costume, and, no, she can't wear the costume every day. * Javi has now decided to be a skeleton (and I have found and ordered an affordable option). He will glow in the dark ... and possibly explode with happiness as he does so. ** I told Billy I'm going to find him a yellow and black striped shirt and bumble bee antenna, and make a black stinger to put on the back of his black pants. He told me he couldn't think of a less manly costume. I beg to differ. 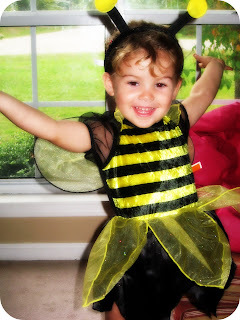 I love the little bee costume! And, if Billy dresses up in the ToriWood version of the bee, I would be totally impressed. I'd say make it a worker bee. A hard hat with antenna on it and a tool belt. That's more manly. Good luck. Think I'm going to try it with my man too. C what happens.